Since Rob wanted to get a long bike ride in around ten, we opted for a birthday breakfast and let Ellie choose the where and what. Of course we ended up at Hagermann's for french toast. Definitely a good idea to open presents first thing—I think we could have gotten away without planning anything else for the day, since she would have been content to play with her new things. She got an MP3 player, some new shoes, a magnetic paper doll, Annie on DVD, a book and new ballet clothes. Great-grandma Clayton joined us, and Grandpa Riley (behind the counter) was able to take a break while it was slow and eat with us. 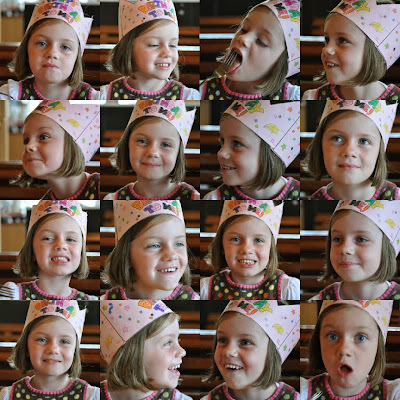 I really tried to get ONE shot without a silly face, but silly and six just seem to go together. While Rob was off logging around 70 miles with Shawn, I whipped up some cupcakes (which were unfortunately not photo-worthy) then we headed to the Murray City pool to hook up with the Stringhams. Ellie was very excited about the water slide, so it was a bit disappointing to find it out-of-order after we had paid and were already in the pool. and fountain fun, they all had a good time anyway. Coming later today (or maybe tomorrow), an interview with the birthday girl. We love you Ellie! This would be a great stopping point. We took the kids swimming tonight after dinner. It was a little cold so while Ainsley was warming up next to me I snapped about 30 photos of her. Oh my gosh I love this face. We've been trying to pack as much fun as possible into this last week before school starts, so I have a bunch of "things we've done" posts to catch up on, but what I really want to post is that it doesn't get any better than this. Well, it might be a little better if we had a cleaning lady at home while we're out playing. But this is about the gratitude I'm feeling...I love this week of fun, I love this stage in our lives, I love my family. And cheese, lots of cheese. Obviously. Today while I was dropping Joey and Will off after drama camp Becca mentioned that they were planning on hiking for Family Night, and we ended up tagging along at the last minute. It was a short, easy hike, but somehow the girls still ended up riding part of the way. Not so many wildflowers on this hike, but the water was pretty. And the company was great—we love the Breinholts. A big bonus for me is the chance to take photos of the kids without too much of a fight. This is at the top, but the Falls were out of my viewfinder. There they are (the lower falls, anyway). So who wants to go hiking with us next week? We had talked about going to the Peter Breinholt concert, but decided it was a little late to keep the kids out when we had church at nine a.m. Luckily the Stringhams wanted to go and we decided to throw responsibility to the wind and join them. I didn't get a great shot of the birthday boy—he WAS having fun, really. It was a gorgeous night and a great venue. We had a great time, although the young couple sitting next to us might NEVER have kids now. The best line of the night came from Scout—Rob was teasing her and she replied "You're the president of the you're wrong club!" The absolute highlight was when Pete wished Robbie Happy Birthday right in the middle of "Flowers." I'm so bummed, I had been shooting video of the kids dancing, but had turned it off as I turned back to the stage, so I missed catching that on video. To top it all off, Pete gave Robbie a signed copy of Deep Summer for his birthday. Robbie declared it his best birthday ever, and it's hard to argue with that! 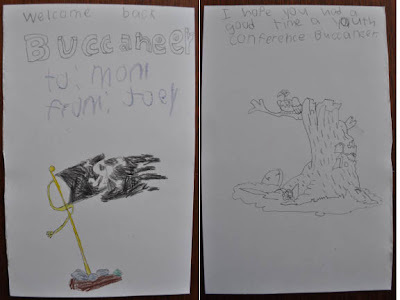 I have NO IDEA where the buccaneer theme is coming from, but Rob and I are relieved to know that Joey has a future career with Hallmark. More later about youth conference and Robbie's eleventh birthday. Until then, ahoy mateys! There are some people who love serving with the youth because it makes them feel young. For me, it's just a reminder of how old I am! I do feel lucky though, we have really amazing kids in our ward, and great leaders (I'm the exception to the rule). Of course the fabulous vacations are a real perk too. This year we went to Manti. We drove down in Sunday dress, had lunch at the park, then headed to the temple to do baptisms for the dead. yummy dutch oven cooking, Forever Strong on the lawn, the "faith" hike, boating, a killer bonfire with smores and a great testimony meeting.